A simple couscous salad recipe with green onions and fresh parsley is stuffed into fresh whole bell peppers of any color. If you need a stuffed bell pepper recipe to use as an entree for a vegetarian or vegan meal, this is a simple and highly-rated one to try. 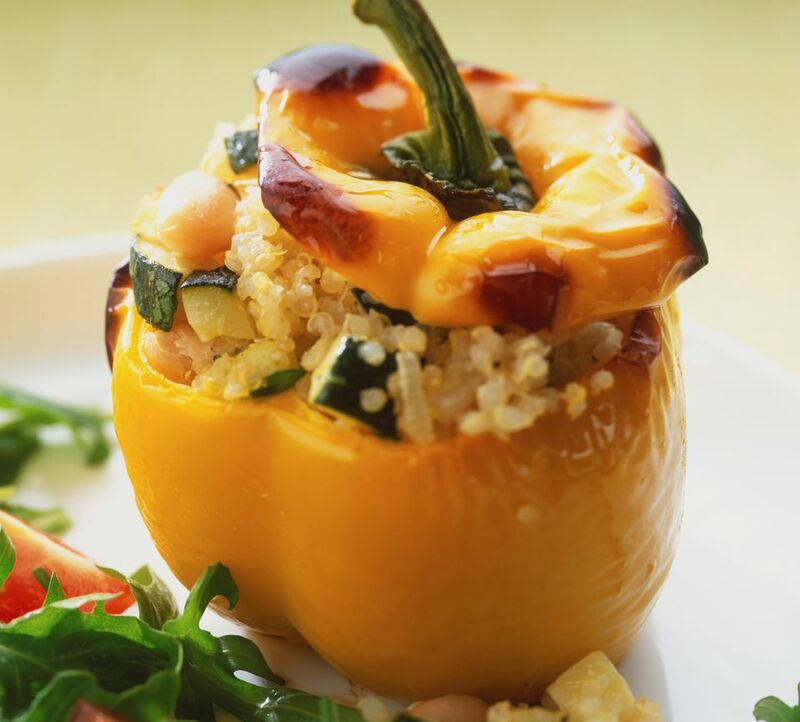 Couscous-stuffed bell peppers are actually quite simple and easy to prepare and make for an excellent vegetarian main dish or for a filling side dish. We love working with couscous because it cooks relatively quickly compared to rice, quinoa or other whole grains or pasta. First, place the 1 cup of water in a medium-sized saucepan and bring the water to a rolling boil. Once the water is boiling, add in the couscous, give it a quick stir, then cover the pan. Turn off the heat and allow the couscous to sit, covered, for about 10 minutes, or until the couscous becomes fluffy when stirred with a fork. Allow couscous to cool completely. While your couscous is sitting or cooling, slice the stems and tops off of the whole bell peppers and carefully remove the cores and seeds from the inside of each bell pepper. Next, in a large bowl, combine the diced bell peppers with the cooled couscous and the sliced green onions. In a separate small bowl, whisk together the lemon juice (fresh is always best! ), olive oil and chopped fresh parsley until well combined. Pour this dressing over the couscous mixture and gently toss to combine. Spoon couscous into each whole green bell pepper, and sprinkle a dash of salt and pepper on top. Roast the stuffed bell peppers in a pre-heated oven at 350 F for about 35 minutes or until your bell peppers are just barely tender. Enjoy! To turn this into a crockpot or slow cooker recipe, you can also place the stuffed bell peppers in a crockpot and cook on low for about 5 to 6 hours. Perfect for a hot day when you don't want to turn your oven on.